Tips for building a list of my local repair businesses? I’d like to have a list of repair businesses that we can give to people who bring something along we can’t repair, or to people who are comfortable with paying for repair - anyone got tips for building this up? I think I’ll have at least two categories - at the top of the list would be people who volunteer at my and neigbouring repair cafe events, and below them non-volunteering businesses - but are there any other suggestions? It’s a really good idea - it’s great to link up community repair and local repair businesses. We’ve mapped out repair businesses here in 11 boroughs in North and East London. We have designed a set of criteria that we used to gauge the reliability of a repair business. The business has 80% or more positive online reviews, with a minimum of 5 reviews. The business provides at least a one-month warranty on repairs. In addition to this, we harness the expert knowledge of our community, and include businesses recommended directly by active Restarters. cc @James_Diamond and @ugo as they worked on these criteria together. Data on repair businesses is collected by researching them online, and by visiting the neighbourhoods in person to find additional businesses without a strong web presence. I know @Club_de_Reparadores were also mapping businesses in their local area too - they might be able to share some tips! Introduce speakers, agenda: Mapping in London, Linking in Buenos Aires, Discussion Aim of session: What do we want to achieve by linking with commercial repair? What can we learn from sharing experiences? 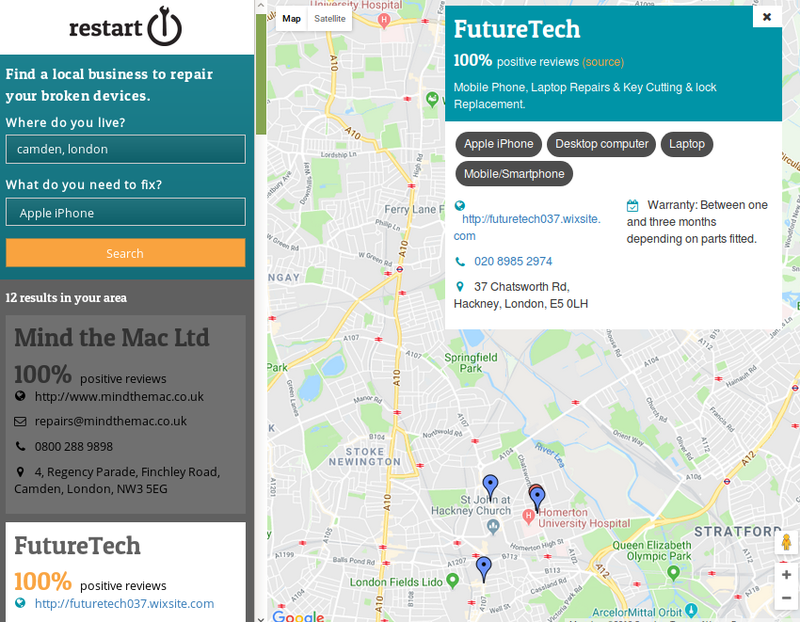 @neil I like the repair directory, how might I/we get it to be available for non-London? I’d much rather point people at a Restart Project asset (with all the benefits that has for promoting Restart) than host my own simple/primitive/manual directory. Can this link up with move to OpenStreetMap as mapping source? In terms of tech the backend is in place for recording the businesses, but I think we’d need to adopt a kind of Citymapper ‘choose your city’ approach for the front end part of the map. Yes - would definitely like to switch this to OSM too.